For many people new to stand up paddle boarding, finding a board can be a little intimidating. This is especially true if you want to find a reliable inflatable stand up paddle board (iSUP) because there are plenty out on the market. Luckily with the Blue Wave Sports Stingray, you get a reliable and versatile board that is great for beginners in the sport. This board has so many features that make it great for plenty of different activities out on the water. It has a construction of high-quality PVC material that helps it keep its shape and rigidity while on the water. This is crucial for staying upright and can really help novice riders find their balance. Not only can you use this board as a stand-up paddleboard, but it comes with a removable kayak seat that allows you to sit and use this board like a kayak. The paddle is also versatile, and you can adjust the size to fit your needs, whether you are sitting or standing. Even better, everything you need to get out on the water comes with the Blue Wave Sports Stingray 10 ft. inflatable stand up paddleboard. You get the seat, a pump, the adjustable paddle, a footrest, repair kit, and a backpack to carry everything with ease. The Blue Wave Sports Stingray is an ideal iSUP for novice riders, and it can bring hours of fun and entertainment. You can learn more about the unique features durability here in our review. The first thing that many people worry about when considering an iSUP is the durability. That makes sense considering most things we inflate for water use, like inner tubes, aren’t that stable or last extended periods of time. That isn’t true with many inflatable stand up paddleboards, and you would be surprised at how sturdy these boards are. The Blue Wave Sports Stingray 10’ inflatable stand up paddle board is created with a high-grade military PVC, which is one of the strongest and most durable materials. This PVC allows the board to keep its rigidity once it’s inflated and helps you stay upright on your board. There are multiple layers of this PVC, and the board is also made with industrial drop-stitch techniques. The outer skin has a double layer that just further reinforces the board’s strength. Beginners often have a little bit of learning curve when it comes to finding balance on a SUP, but the grip deck on the Blue Wave Sports Stingray helps combat that issue. The deck has non-slip Z-Ray Soft Grip Technology that helps keep your feet in place while also adding extra cushion, so standing on the board for a long time stays comfortable. While solid construction and added stability are vital in a good iSUP, the Blue Wave Sports Stingray has even more versatile accessories that can transform this board into more than just a SUP. First, the board comes equipped with plenty of storage options for your gear so that you can stay out on the water longer. The bungee system at the back of the board secure things like your sunglasses, flip-flops, backpack, or any other gear you need. There are also D-rings that allow you to secure and tote things like a cooler or dry bag. One of the neater features and accessories that come with this board is a removable kayak seat. There are two additional D-rings towards the front of the board that allow you to clip in the included kayak seat. There is also a removable foam footrest to help keep you in position while you paddle. 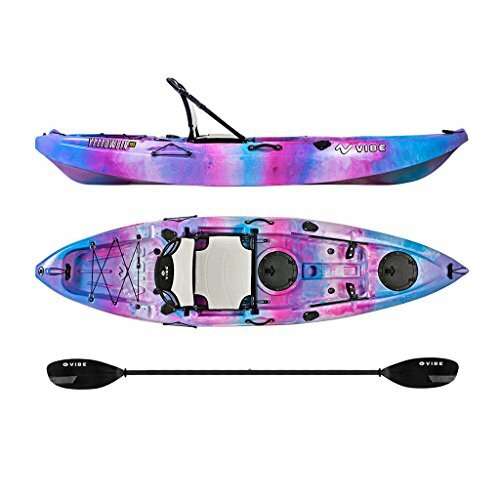 This feature not only allows you to stand up and paddle on open water but essentially turns the SUP into a kayak that you can take out on calmer rivers and creeks. The paddle is also versatile and can change with whatever function you choose to use your SUP. You can adjust the paddle to its longest length to stand up or shorter to use as a canoe paddle if you decide to sit. The paddle also comes with an additional blade so you can transform it into a kayak paddle. If you drop the paddle, don’t worry because it floats! Finally, the board also has three fins on the bottom to help with tracking. Typically, most boards only have a central fin, but it is becoming standard practice to add two side fins to create better steering. The center fin can detach from the board, so it is easy and compact to store in the included backpack. Durable construction – Thanks to a multi-layer drop-stitched high-pressure core, you can be sure that this board isn’t going to collapse the minute you get it out on the water. Military grade PVC just further ensures you have a smooth, stable, and comfortable ride. Versatile riding options – It’s rare that an iSUP will come with multiple riding options, but the Blue Wave Sports Stingray allows you to stand or sit, the minute you get the board. With the available kayak seat and footrest, you can comfortably sit and ride or test out your skills and learn how to balance on your board. The accompanying paddle will adjust to however you choose to ride. Quality grip pad – A good grip pad on the deck of a SUP is key, especially for novice riders learning how to stand on the board. The Z-Ray Soft Grip Technology provides a stable yet comfortable standing surface and even adds cushion to your ride. This technology also helps make longer trips possible. Cargo space – The Blue Wave Sport comes with a 1-year limited manufacturer’s warranty. When it comes to finding the right board, it’s important not only to look at the features and specifications but hear what actual customers think of the product. So, what are the reviews on the Blue Wave Sports Stingray 10 ft. inflatable stand up paddleboard? You’ll be pleased to know they are overall great! By far the most commented on feature was the removable kayak seat and adjustable paddles. Many iSUPs have the ability to add a kayak seat, but not many actually come with the removable seat and few if any have a paddle that can transform into a double kayak paddle. Customers also loved the price point of this board and said it was a great start as they began learning the ins and outs of stand-up paddling. While there weren’t many negative reviews, there were a few things customers agreed could improve. The first was with the included pump. Like many pumps that come with inflatable stand up paddle boards, it is a little difficult to get the board fully inflated. It isn’t impossible but to get the last few psi; you have to put in some extra effort. A few people also thought the instructions manual was a little sparse and could include more detailed steps. They also noted that because the maximum weight is only 220 pounds, bigger guys might have a harder time using this board. Other than those few details, the reviews were mostly positive. For many customers, this board was their first foray into the world of SUP, and they all thought the Blue Wave Sports Stingray did an excellent job on calmer waters. Customers also enjoyed the convenience of keeping the board in their car at all times and not worrying about strapping a hard board to the roof of their car. If you have always wanted to try stand-up paddleboarding but don’t know where to start, the Blue Wave Sports Stingray 10 ft. inflatable stand up paddle board is a great first board. It provides enough stability through the multi-layer drop-stitch construction, and the high-grade PVC maintains it rigidity once inflated. These features all translate into better balance out on the water and overall durability. This board is also versatile, and if you want a comfortable way to paddle around your favorite lake, you can easily attach the kayak seat and footrest to sit. You don’t have to worry about getting an extra paddle either because the one included will adjust to your needs. 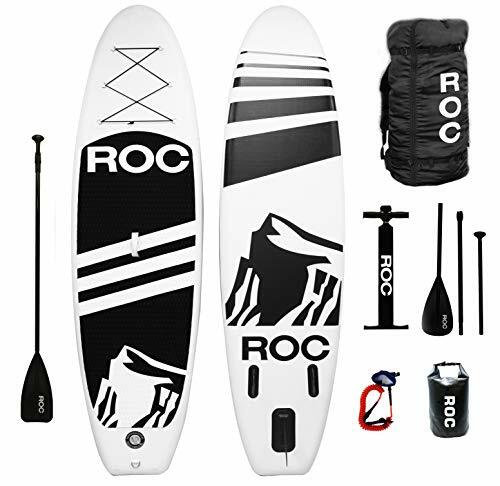 Further adding to the appeal of this board is the comfort of the grip deck and the ability to store most of your gear while you are out on the water. The Blue Wave Sports Stingray is one of the best first iSUPs you can purchase, and you are sure to enjoy hours of fun out on the water.